At Detroit’s N’Namdi Center for Contemporary Art, John Sims conducted a two-hour-long Confederate flag funeral. 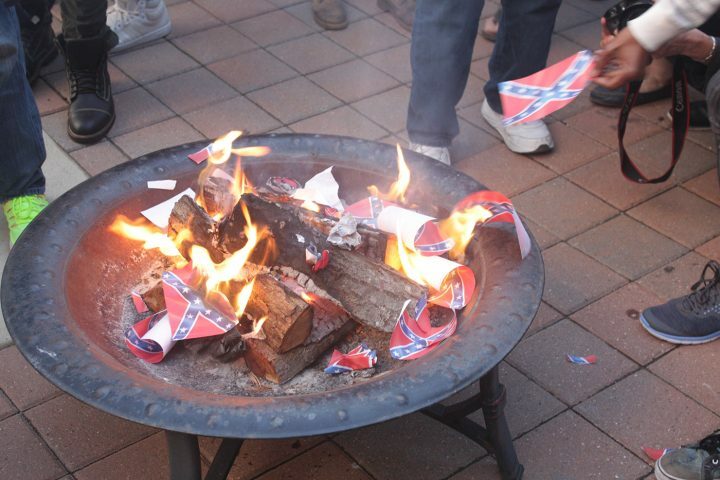 The symbol in question on Monday was a Confederate flag, which went up in flames in the midst of an hours-long performance that commemorated the enduring legacy of racial oppression in the post–Civil War United States, as well as the ongoing efforts of those who fight for justice. The May 29 ceremony was more than a symbolic act of destruction or reclamation of an object designed to terrorize African Americans. Sims, a native Detroiter, has been burning and burying Confederate flags for 16 years, with what he characterizes as “some success” in engaging audiences of all races in reflection and conversation on the history of racial injustice. The evening program at N’Namdi mirrored a memorial service, with preachers, poets, and political activists speaking as if at a Confederate flag funeral. The opening prayer was performed by Pastor Jeff Nelson, followed by poetic reflections from Kim Hunter, M.L. Liebler, and Jessica Care Moore, an electrifying dance meditation by Jennifer Harge, the screening of several video works and a reel of 13 eulogies from other flag funerals conducted by Sims, and then the main burn-and-bury event. 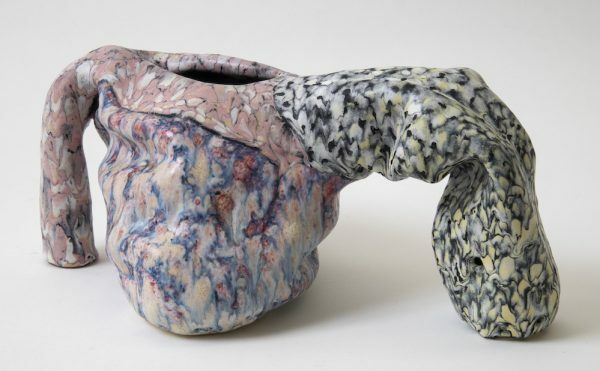 Much of the evening’s content was thin on metaphor and heavily didactic; Sims and his cohort grappled with their subject in the most direct terms. “We deal with white supremacy every day,” said Care Moore, before performing a poem that included her reflection on the 9/11 attack on the Twin Towers. 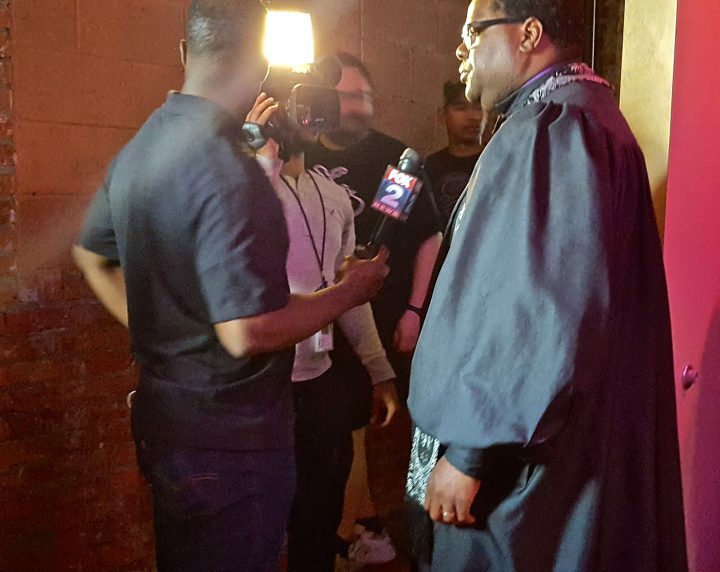 “We deal with white supremacy, especially in Detroit. There’s a takeover happening right now. When people can have openings of new hotels, and there are 10 black people out of 500.” Her commentary was met with claps and cheers of assent from the crowd, which packed the space to standing room only throughout the two-hour ceremony. “Will we finally become equal under shared oppression?” she asked in her poem, continuing on to a litany of historical and contemporary abuses heaped upon marginalized communities the world over. “If it took the Twin Towers falling on your head to see white supremacy, then shame. On. You,” she concluded. Many of the performances incorporated “Dixie,” a minstrel song–turned–Confederate anthem that’s now an iconic piece of American folk music; it touches on the way the roots of Southern pride are wound around the perpetration of slavery. Harge executed her dance to it, while Hunter performed a poem that riffs on its lyrical structure and Sims screened videos featuring new takes on the song. 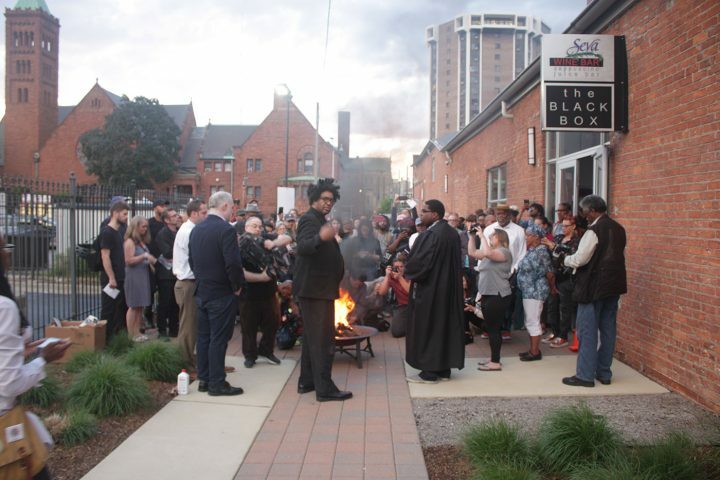 After roughly 90 minutes of performances, prayers, poems, and eulogies, the audience moved outside for the culmination of the event, the burning of the Confederate flag. By this point, the symbol had been thoroughly dragged, and the length of the ceremony had whipped some audience members into a frenzy and reduced others to a torpid state. Though the central act was the igniting of the full-size flag that had lain at the front of the room throughout the evening, small paper effigies were distributed to the attendees, who took turns tossing them into the fire. News cameras crowded in close to the conflagration to catch the money shot of burning flags. For those of us outside the military or other formal institutions, there’s relatively little social protocol for the handling of flags, including their destruction. 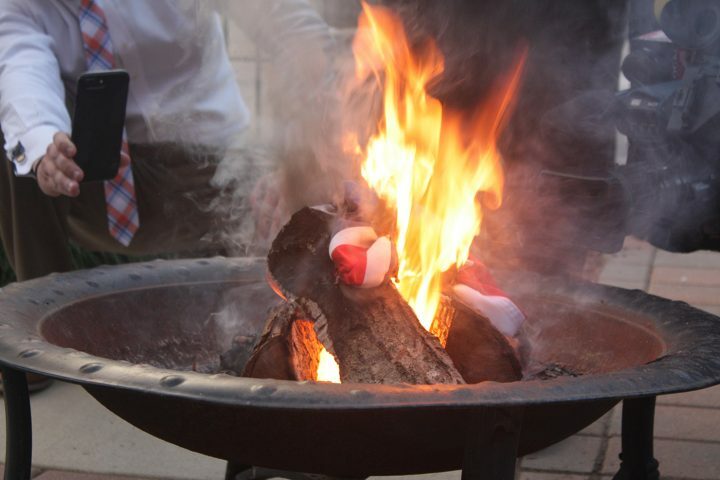 However, the United States is a flag-heavy culture, and we may have some awkwardness or frisson about the idea of a formalized ceremony for burning one (what does one wear to a flag funeral?). The level of gravitas applied to the occasion at N’Namdi underscored both Sims’s seriousness in his consideration of the transformative power of the act and a desire to elevate the proceeding above the acts of terrorism to which it serves as a counterpoint. The event received some press ahead of time, and Sims has faced protesters before, but on Memorial Day, no one turned up to express dissent. The spirit of the crowd at N’Namdi was unified, even celebratory. John Sims’s “Burn and Bury Memorial” took place at the N’Namdi Center for Contemporary Art (52 E Forest Ave, Detroit) on May 29. A video of the event can be seen here.